“Mom, I found a hummingbird on the floor of the garage, and I think it’s hurt,” my daughter Sarah said. I scurried out the back door and down the steps as Sarah crouched over the tiny bird. Its legs were all tangled up in some sort of string or webbing, and its chest was heaving in and out with irregular movements. Sarah gently removed the string-like material from its legs. Sarah scurried off to the kitchen to make some hummingbird nectar. I watched in amazement as she dipped her little finger into the bright red liquid and held a tiny drop up to the delicate bird’s slender beak. I was even more surprised when a sliver-like tongue curled out the bird’s mouth and began drinking the ruby-colored fluid. This process continued for an hour and a half. Then, very carefully, Sarah scooped the beautiful creature into her hands, stepped outside the garage, and raised her cupped hands to the sky. The hummingbird flew off into the distance. Watching Sarah with that fragile winged beauty reminded me of how the Lord so lovingly cares for each of us. We all have times when we feel broken. The disturbing diagnosis. The terrifying newscast. The broken relationship. The financial crisis. The heartbreaking loss. When these times hit, we feel like that limp bird on the floor of the garage, weak, vulnerable, and struggling to survive. In the midst of it all, we can rely on this truth: “The Lord is near to the brokenhearted and saves those who are crushed in spirit” (Psalm 34:18, NASB). When we feel numb and broken, He carries us like a loving father carries his son through the wilderness (Deuteronomy 1:31). He promises to never leave or forsake us (Joshua 1:5). The Lord gives us what we need. In those especially difficult places, the Lord feeds us and helps us grow stronger, just like my daughter did for the little bird. We are told in Psalm 23:1, NLT, “The Lord is my shepherd; I have all that I need.” The New Testament says it this way: “And this same God who takes care of me will supply all your needs from His glorious riches, which have been given to us in Christ Jesus” (Philippians 4:19, NLT). Because He loves us, He takes care of us. When the prophet Elijah was terrified and exhausted, the Lord gave him food and water and encouraged him to rest (1 Kings 19:1-8). The Lord knows what each of us needs in our current circumstances, and He provides those things for us. We are told, “He gives power to the faint, and to him who has no might He increases strength” (Isaiah 40:29, NLT). After our seasons of brokenness, after we have spent time in His presence and experienced His provision, He lifts us up to the sky and enables us to fly. He promises us, “Yet those who wait for the Lord will gain new strength; they will mount up with wings like eagles, they will run and not get tired, they will walk and not become weary” (Isaiah 40:31, NASB). The idea of waiting on the Lord involves waiting confidently and expectantly, trusting in Him, relying on Him. We grow stronger in that place, and He equips us to soar to new heights with Him. We discover in that place that He is “the Father of mercies and God of all comfort, who comforts us in all our affliction so that we will be able to comfort those who are in any affliction with the comfort with which we ourselves are comforted by God” (2 Corinthians 1:3-4, NASB). In other words, not only does the Lord help us to fly with Him above and beyond our difficulties, but He also equips us in the process to help others to do the same. 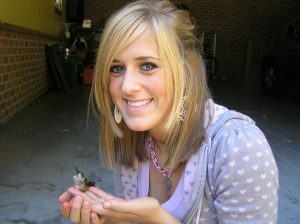 My daughter’s encounter with the hummingbird happened many years ago, but I still remember the truths the Lord taught me through it. May you experience His presence, provision, and power to fly wherever you are today. The Lord is faithful, and He will help you to soar!